Manchester United = America’s Team? With the Fed’s takeover of AIG, we all are part-owners now. Author DanieldinhoPosted on September 19, 2008 Categories UncategorizedTags AIG, Manchester UnitedLeave a comment on Manchester United = America’s Team? Another great soccer video — this one of Ronaldinho, starting as a child, and moving up from there. OK, I think I am gaining a little respect for the Barcelona Brazilian. The thing about inclement weather is that, sure, it can affect the outcome of the game … but both teams have to adjust equally. My favorite bottom-of-the-barrel Premiership team, Wigan, has survived relegation … but their manager, Paul Jewell, has said he’s had enough and will be taking a break from football. Interestingly enough, it was the Wigan loss against Arsenal — whereupon he mouthed off Mark Cuban-style about the ref — that really got me into the game … and appreciating the beauty of the threat of relegation! 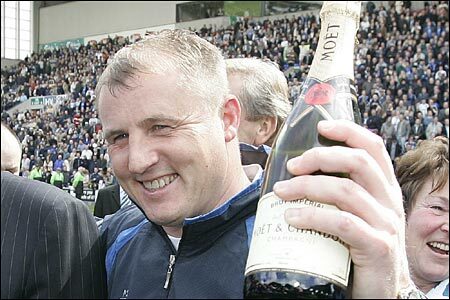 Paul Jewell may be gone, but here at Soccerati, he will not be forgotten.